The Consumer Confidence Survey provides an assessment of respondents’ perceptions on general economic conditions and own financial situation during the current period and a year ahead. The survey captures qualitative information on a three point scale i.e., improve, remain same or worsen, from respondents spread across six metropolitan cities viz. Bengaluru, Chennai, Hyderabad, Kolkata, Mumbai and New Delhi. The information so collected is analysed in two parts, viz., current situation as compared with a year ago and the expectations for a year ahead. In the latest Consumer Confidence Survey, field work was carried out between February 23, 2016 and March 06, 2016. The salient findings of the survey, based on the responses of around 5,200 respondents are presented below. I. 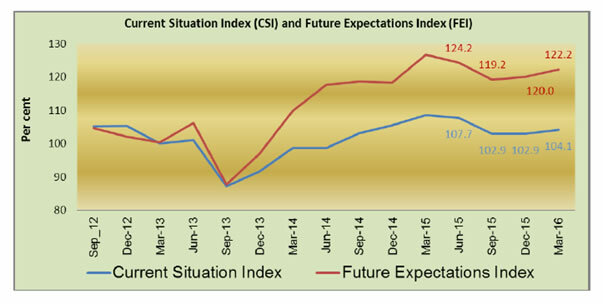 Current Situation Index (CSI) and Future Expectations Index (FEI) expanded marginally by 1.2 and 2.2 per cent in the current round of survey as compared to December 2015 round. The marginal improvements in the indices were mostly due to increase in the positive perceptions on economic conditions, income and prices. II. The perceptions of the respondents in March 2016 round of the Survey indicated improvement in the general economic situation, as measured by net response, both for the current and a-year ahead period. Moreover, the proportion of respondents reporting improvement in current and future economic conditions, which had shown decline in September 2015, continued to increase for the second quarter in succession (Table 1). III. The optimism regarding increase in current income and income outlook is higher with net responses improving by around 4 and 5 percentage points respectively as compared with December 2015 round of survey (Table 2). IV. The perception level of the respondents on spending (both current and future) has been persistently declining since June 2015. However it continues to be strong as more than 75 per cent respondents reported increase in spending for the current and one year ahead period (Table 3). V. As regards perceptions relating to spending on essential items, around 80 per cent respondents reported increase for the current as well as future period, although the said share is lower than previous quarter. The decline in positive perceptions on spending was strong for non-essential items compared to essential items (Tables 4 and 5). VI. Employment outlook as well as current employment perception deteriorated during March 2016 round of survey. Current employment perceptions based on net response slipped in the negative territory in March 2016 round of the Survey (Table 6). VII. As regards price levels, current as well as one-year ahead sentiments showed an improvement in this round of the survey. Current inflation and inflation expectations also showed signs of easing (Tables 7 and 8). Note: Perceptions of increase in prices is considered to be negative sentiments and decrease in prices is considered to be positive sentiments. The net responses are therefore, negative. 1 The December 2015 round of the survey data was released on February 3, 2016 on the RBI website. The survey results are based on the views of the respondents and are not necessarily shared by the Reserve Bank of India.